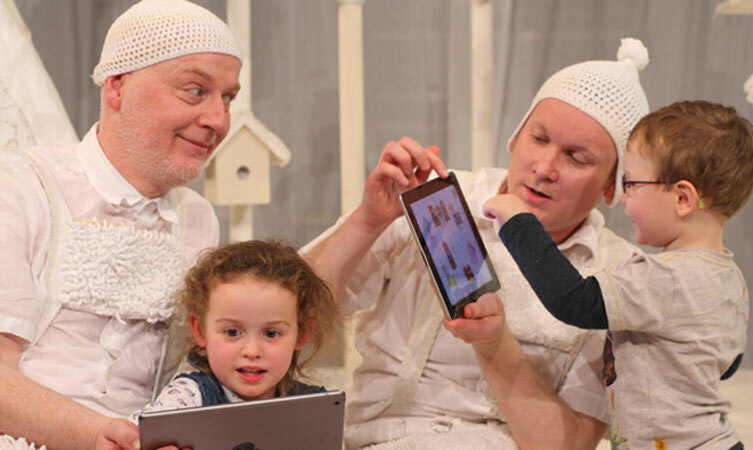 On Wednesday we had a wonderful photo opportunity, as Catherine Wheels had a preview of White: The Show before the team head off to France, there was a lovely receptive young audience and Cotton and Wrinkle enjoyed showing off the app to some of the kids after the show. The hippotrix team enjoyed it too, with everyone bringing their young families. It was particularly nice for Mark, as he has worked for 5 months on the app and had never seen the show. One thing we would have loved to have seen though – was the preview in the morning – It was all in French!